Grant Thornton is Ireland’s fastest growing professional services firm. The firm comprises over 1,200 people operating from offices in Dublin, Belfast, Cork, Galway, Kildare, Limerick and Longford. They recently commissioned iQ to work with them to create a new 3D Built-Up Sign for the front of their flagship HQ building on City Quay in Dublin – a sign that would really impress. To create a 3D Built-Up Sign in Stainless Steel and Aluminium of the current Grant Thornton logo. This had never been done before. Until now, the logo had only ever been produced in 2D. The Grant Thornton logo is somewhat unique in that it is a logo made in one continuous loop – a “Mobius Loop” – that works its way in and around itself in one continuous swirl. So in effect, the challenge was to create and build something in Stainless Steel and Aluminium, which had never been achieved before. The first step was to interpret the Grant Thornton’s 2-dimensional logo in a 3-dimensional form. We did this using various 3D-Software packages. After many versions and amendments, the final-shape was agreed with the Client. This was sent through to a 3D-Printer who made a miniature model of the Mobius Loop. Our Team used this miniature to physically visualise how we would build a shape like this with our Metal-Fabricators. Our highly-skilled Fabricators then set about the challenging process of forming the Stainless Steel, and Aluminium on their work benches – using various clamps and presses. Once they got the shape exactly as they wanted it, they carefully welded along the seams of each crescent and wave of the shape. Next was the arduous task of getting the shape perfectly smooth. The end result had to be perfectly smooth to retain the sense of flow integral to a continuous form like this. This took many (many) hours of meticulous work. 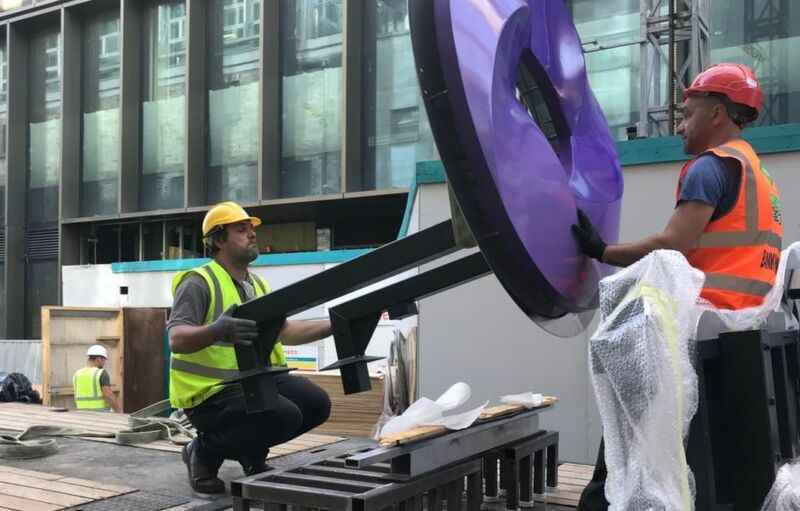 Once achieved, the final stage was to paint the Mobius-Loop in the Grant Thornton brand colours. This in itself was a major challenge as the Grant Thornton logo has a colour-gradient in it that adds depth to the wave-like shape. The painted-colour gradually changes from light to dark shades. Next, the finishing touches. iQ filled the Mobius Loop with high-powered WHITE-Light LED’s. This allowed light to emanate from the rear of the Loop. The light reflects off a polished mirror stainless steel backing plate to create a beautiful halo-effect of light all around the Logo. To finish off, iQ also manufactured large Built-Up Stainless Steel Letters that are cavity-backed and filled with LED’s. This completes the full Grant Thornton brand name. Overall the sign is 9.5-metres wide. The Mobius Loop is 2-metres high. The sign was destined for the 5th floor of Grant Thornton’s new HQ offices in the centre of Dublin, facing onto the River Liver. The sign had to project off the roof on purpose-built steel projection arms. Don’t forget, the sign is huge! iQ fabricated and chemically anchored purpose-built steel sockets/boots onto the roof. 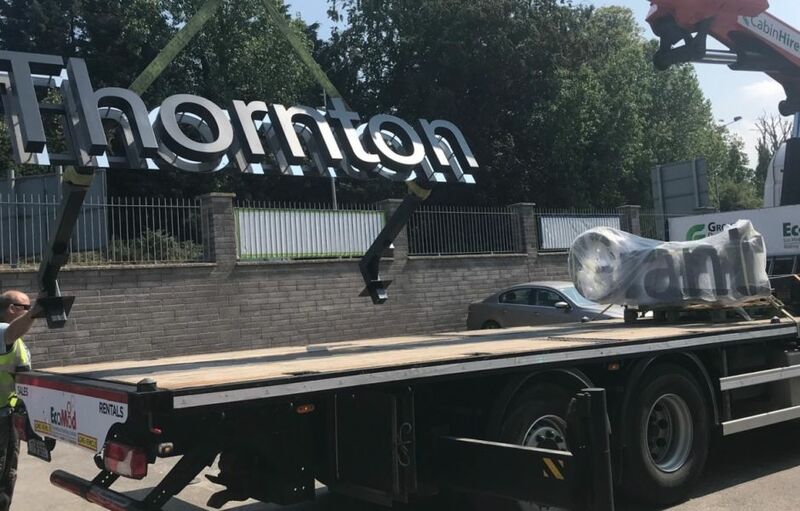 Then, we lifted the sign 30 metres up in the air and over Grant Thornton’s new building, dropping each section gently into position on the 5th floor roof, facing the river. The day of the Installation was quite complex and involved closing a road to set our crane up (on an adjoining street). 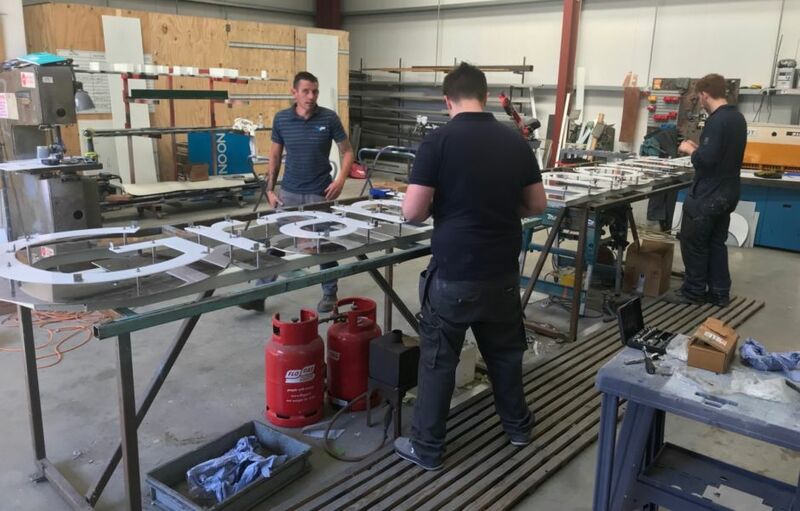 Each large sign-element was craned carefully into position over the waiting steel boots by our Fitting Team – the margin of error was a mere 1mm for the steel sub-frame to slide over the steel boots and marry-up before bolting down. Thankfully, each piece fitted into position perfectly, and a secure snug-fit was achieved!